A pinch of smoked sea salt. 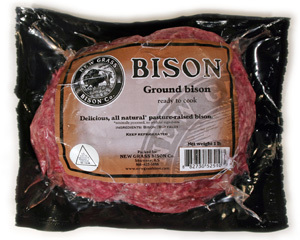 Like all burgers, the secret to keeping bison burgers moist is minimal handling. Open the package, put the square chunk on a plate, season it with the smoked sea salt and pepper. Transfer it to a broiler rack. Broil until it’s done to your liking. Mrs. E, being quite the gourmet, likes meats cooked rare. Meanwhile, sauté the mushrooms and scallion in a little butter and Worcestershire sauce. When the mushrooms have released their juices and the scallions become transparent, add the dry mustard and flour. Cook, stirring for a minute or two. Drop in the mushroom base and add the red wine. Cook, stirring until you’ve got a nice little sauce going. Stir through more butter at the last moment. Arrange the salad around a plate and plop the meat into the center. Top the bison with the sauce. You may wish to dress the salad with a vinaigrette. Start with your turkey soup as an appetizer. Or, better yet, don’t. This entry was posted in Entertaining and tagged dinner party, Entertaining, food, recipe. Bookmark the permalink.